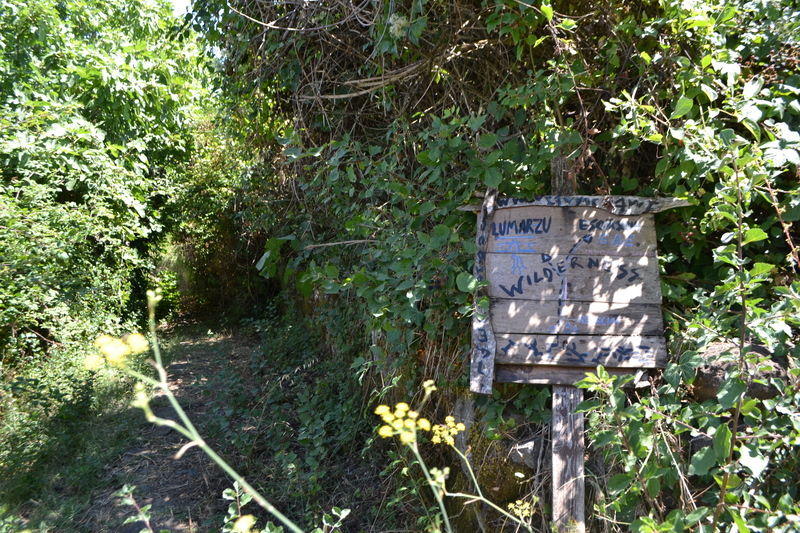 A sign off the main road reads – Rebeccu medieval village – the road winds; upwards past an old Gothic Aragonese church surrounded by grazing sheep to the small hilltop village of Rebeccu – a lost village 508 metres above sea level. That’s is not to say that the village is deserted; just that its’ population has reduced and indeed bar a small bar in the compact village square the place was deserted! 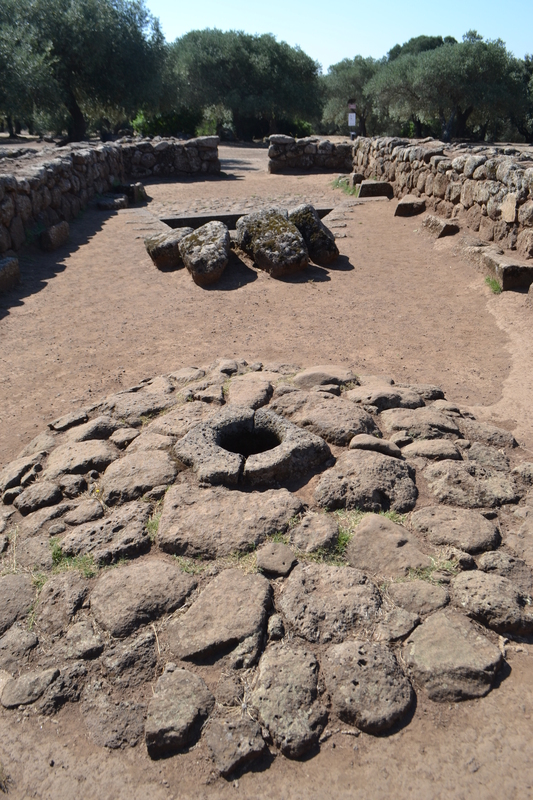 This an ancient community with evidence of centuries of inhabitation – the Tres Nuraghe for example. The hills around are peppered with rock cut cave tombs and within the larger parish is the incredible Sant Andrea Priu tombs with their caved sacred cow, Roman wall paintings and early Christian iconography…..an incredible example of ritual continuation – indeed when I visited there appeared to be animal skull placed rather than left on the summit of the caves suggesting that such rituals survive in modern Sardinia. At this village bar I enquired about the Fonti Su Lumarzu. They knew it but it appeared to be a distance away; quite remote and removed from the village. Indeed a small wooden sign indicated its location taking a small track through an area called the wilderness. Talking this path it flowed down the valley to an open area when I was assured I would find the well. Just before this and beside a stream is a small well, well I assumed it was, it was dry but resembled one. Indeed, one could be confused to think this was the exact site although it lacks the isodomic nature of the basalt blocks or the basin. Indeed, although there is some old fabric this would appear to be modern – probably medieval!! 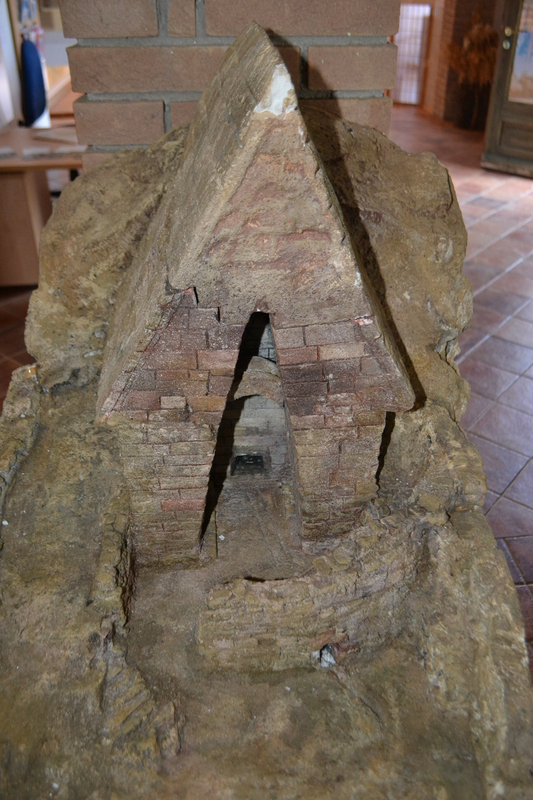 The well is a perfect miniature pozzo only a metre six in height and 97 cm wide at its base. Constructed into the hillside to take advantage no doubt of the spring which arose here and is channelled through a canal with T blocks. 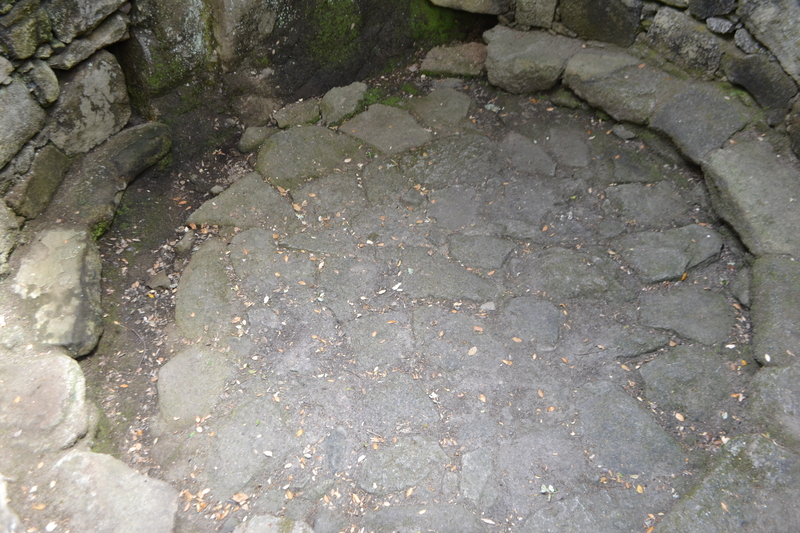 The well is constructed of the usual basalt being partially isodomic, some blocks being smaller than others, probably to fit into its location. One can still see evidence of the original clay and lime based mortar on some. The spring fills a circular basin with a monolithic bottom conch. Looking up it is clearly enclosed with a tholos as typical. The water is accessed from a square cut opening. 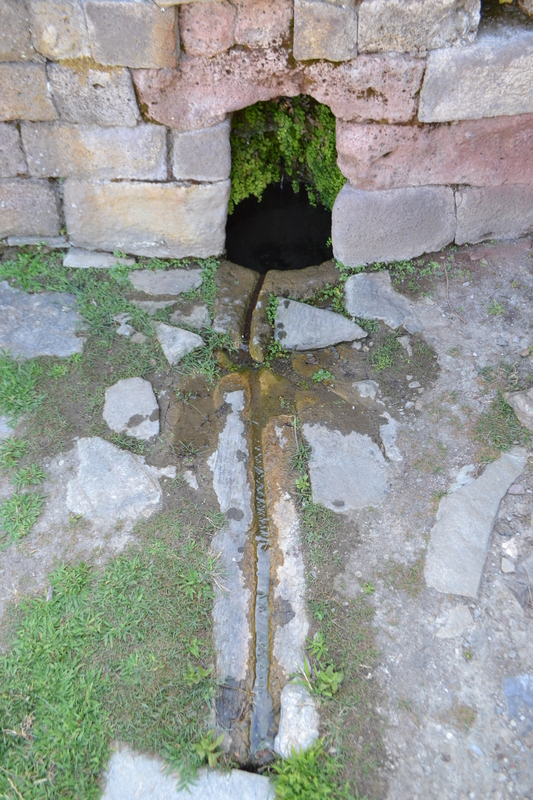 Water then flow beneath the floor of a paved rectangular vestibule only around 5 metres to 2, appearing from a hole and down a grooved stone into a small brook. Little is recorded concerning the use of the site but a nice suggests perhaps votive offerings. 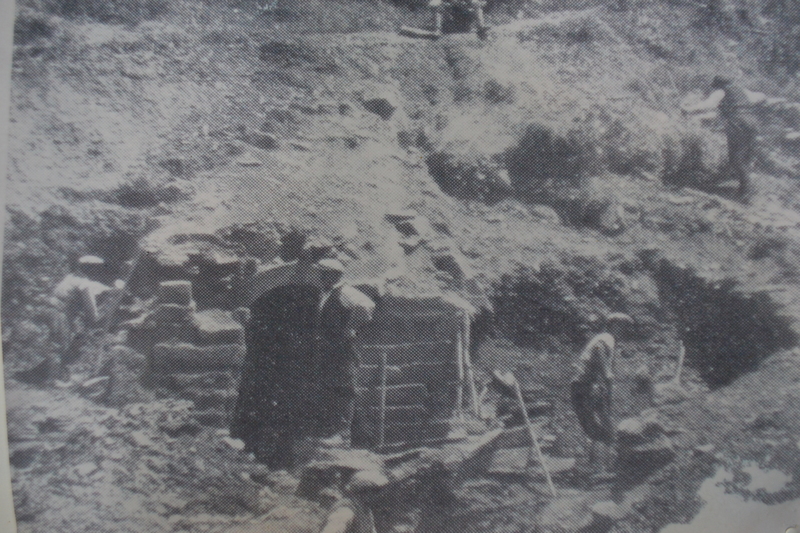 Taramelli (1919) in his Fortezze, recinti, fonti sacre e necropoli preromane nell’agro di Bonorva, discovered miniature Nuragic pottery jars which may have had a ritual function but equally could have been domestic. Interesting sherds of such pottery were found in the mortar when the site was restored in 2004. Was this purely for bonding or did it signify a ritual deposit? Certainly like more substantial Pozzo, there are lateral and frontal benches, for ‘priests’ or although equally for those wanting a rest, wait or chat at the well (many British Holy wells have such arrangements and it should be noted these are purely functional in use). What is interesting was the find of Roman Imperial coins in this vestibule. So it is clear that like the town the well continued generation over generation to provide both function and perhaps ritual to the settlers on this hill. As indeed the fresh flowing water does today despite a flowing spring beside the church which fills a substantial rectangular basin. Perhaps this water is better, it certainly was a delightfully refreshing draft and needed as I ascended back up the hill and into modernity.. 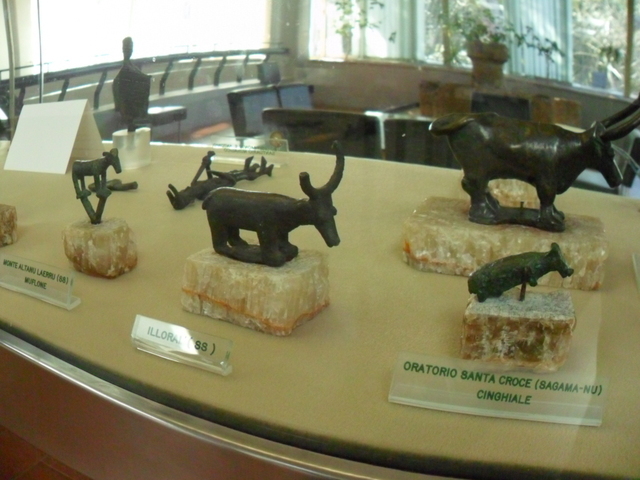 In my regular posts this year on the incredible prehistoric sacred spring history of Sardinia, I have referred to votive offerings the bronzetti and other votive offerings. I thought it would be worth a brief post examining these structures. A votive offering is an object given to a religious site for ritual purpose in hope of some intercession from a spiritual figure. At thirty three pozzo sacro temple sites votive objects have been found out of seventy-five known sites. Of course all sites could have had such deposits and were lost as the sites were either robbed or converted to other uses. What is interested is the range of objects, some appear to have a direct link to the temple others more circumstantially linked. Many are linked to a cult usage of the site and probably represent worship at the site. Others appear are presumably linked to economic concerns, such as those upholding bread – although this could be considered sacred bread – or private or even military concerns. In many ways these objects reflect similar themes to those in British sites. However the bronzetti are the most curious. Around 500 of these curious figures have been excavated. They are found in association with a number of sites across Sardinia, but particularly the Pozzo Sacro. The bronzetti are small bronze statuettes which greatly vary greatly in their appearance using being around 40 cm high but representing animals, ships and divinities. They were made via lost wax casting, a technique used by a number of ancient civilizations. The bronzettis are associated with Bronze Age and early Iron Age sites, the Nuragic culture, dating from the ninth century BC and the sixth century BC, particularly the pozzo sacro and the megaron temples. 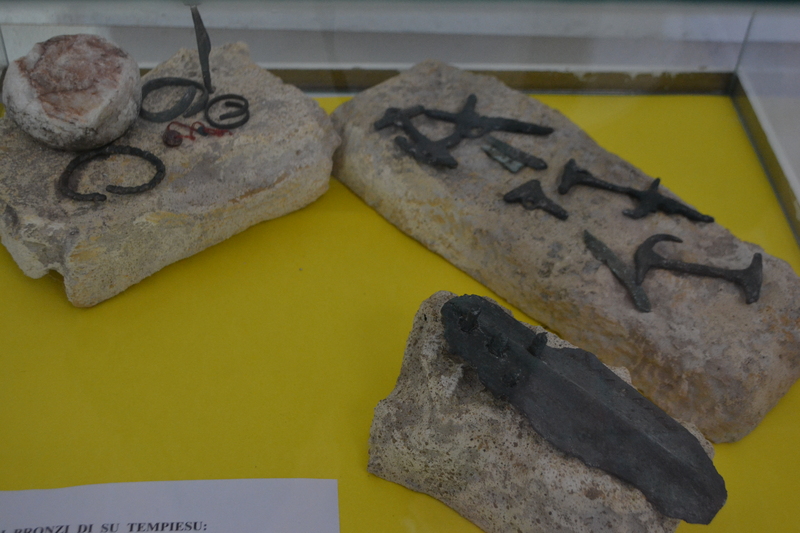 Unfortunately the Nuragic community left no written record so the usage of these votive objects can only be surmised. Niches are found in a number of pozzos and it is thought such figures were placed in these – similar to the placing of deities and saints in niches in modern religions. One of the most curious is that of Sa Testa, a wooden figure, perhaps the precursor of the bronzetti and similar in ways to the Dagenham idol in some ways. One particularly common bronzetti is a cloaked figure representing, it is thought, a priest. Alternatively the figure may represent a spirit of the spring. Bulls are also found at sites. Horned creatures resonate around the prehistoric civilizations of the Mediterranean and the Nuragic communities were no different. A bull figure is associated with Predio Canopoli. The goat as noted at Sa sedda sos carros was clearly a sacred animal and indeed bronzetti showing a lamb being carried on a person’s back such as Santa Vittoria or lead on a leash at Serra Niedda do indicate animals being prepared for slaughter. These finds appear to link to the idea of animal sacrifice and indeed burnt bone fragments have been found at a number of Nuragic pozzo sacro sites. Ships laden with soldiers are widely found as bronzetti figures and may have been given to ask for success in local conflicts or otherwise may represent the passing of the congregation into a watery afterlife. Perhaps the most curious is the finding of weapons and everyday objects. 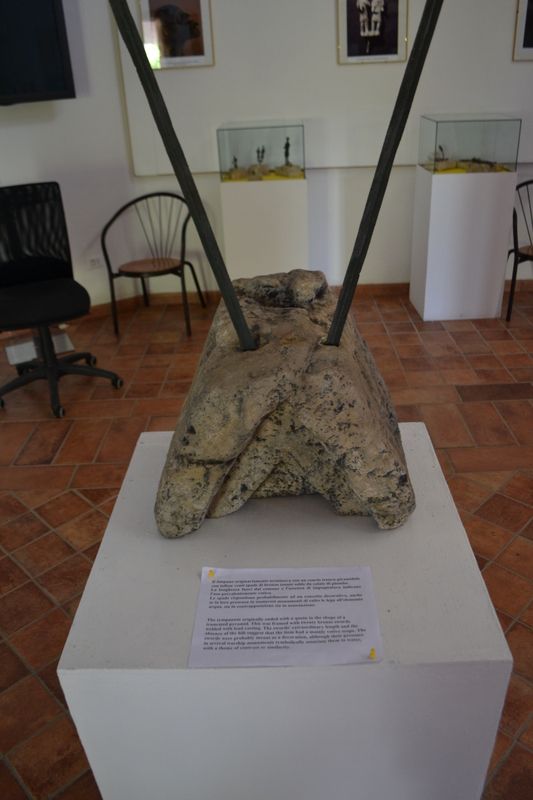 Weapons may have been deposited like those found in British sacred sites such as those inserted into the top of Su Tempiesu coping stones. However, the finding of some objects is more problematic. Such as stone hammers. Were they accidentally dropped by the masons of the well or given there to say thanks and offer protection to the structure? 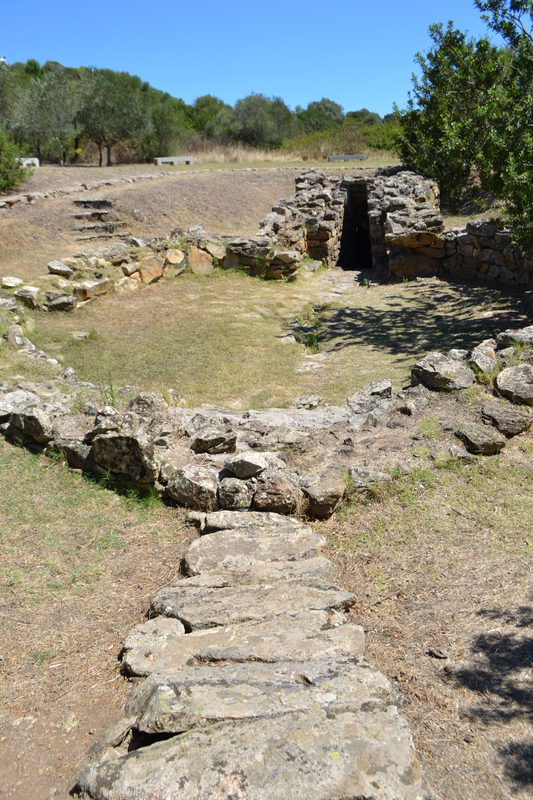 It is curiosities like this which make Sardinia’s sacred spring sites a fascinating subject. 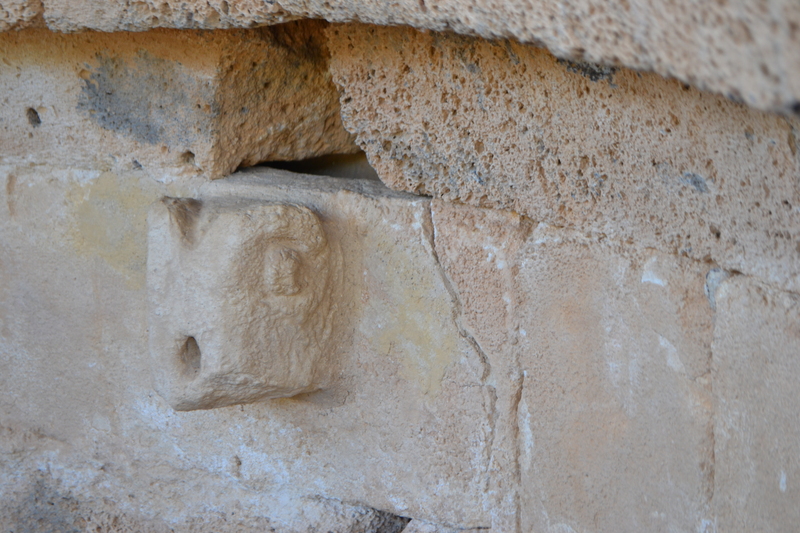 One of the most remarkable aspects of Sardinia archaeology is that it can constantly surprise. The journey to Sa Sedda and Sos Carros is a long and winding one, through dirt tracks and narrow roads. It puts us in contact with remote places and ancient worlds. 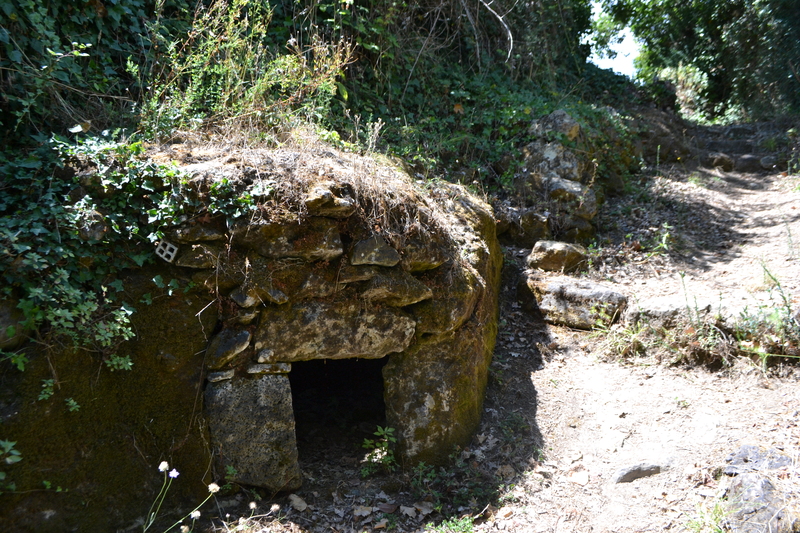 Although this Nuragic complex dates from 14th century BC its location in a valley rich in Palaeolithic remains and evidence in nearby caves of some of the earliest human habitations in Europe, Sa Oche. Sa Sedda and Sos Carros is often overlooked by those taking a track to the better known Tiscali, but it is just as unique if not more so…for the one thing Tiscali did not have..a water supply. The site consists of a several huts which focus on a sacred area, characterised by a central court. Several circular rooms surround the courtyard with one of them containing a beautiful and unique sacred fountain this was built with the use of basalt ashlars. One made with limestone ashlars and had some ram protomes from which the water originally poured gathering in the central wide circular basin. The room is paved with limestone slabs and has a counter-bench running along the wall. In this area it was found a big votive deposit, including numerous bronze objects currently at the Museum of Sassari. Archaeologists found a large quantity of bronze offerings and an orientalising bowl dating from the 8th century. 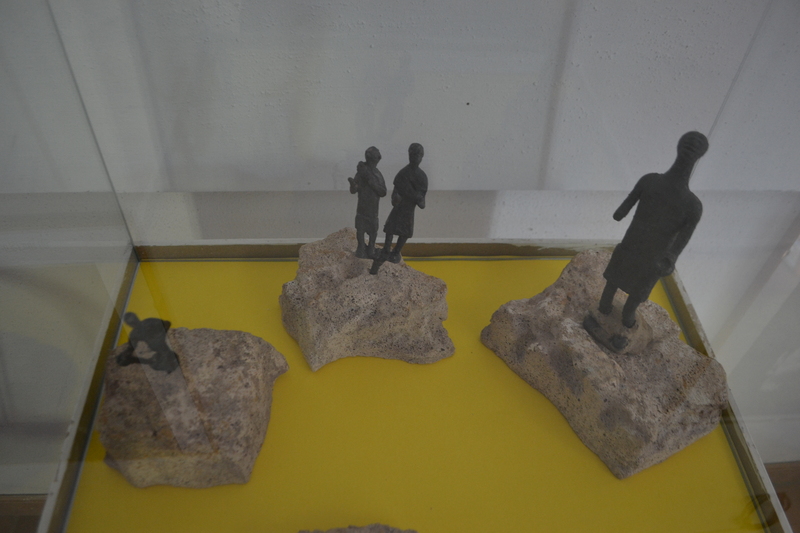 In 1977 excavation discovered such a range and size of bronzes that it may have been a foundry. Evidence of iron slag was also significantly discovered. However no crucibles nor layers of ash to prove the foundry theory so it would suggest that this was a significant site. Two particular aspects are notable of this area. The most noticeable are the uses of basalt blocks, some of which are over 1 metre long. Basalt is not found locally and so their presence is interesting. How did they get here and from where? One theory is that they were recycled from an earlier sacred building, however this asks the question where did these come from and why? The why is easier to explain. The basalt blocks are arranged in one room which appears to be a storage tank for water. This would be important because basalt is impermeable to water and in such a dry environment every drop would be valuable. The unique aspect of the well are the ram heads. Rams are found as votive bronzetti such as that which can be seen in Cagliari museum dating from the 8th-7th century. We know very little of the Nuragic civilizations religion but of course the ram is a common deity not only across ancient Europe, but across the world and in particular. Often the subject of sacrifice even within the Bible it is both slain instead of Isaac by Abraham and represents the ultimate sacrifice as Christ in the New Testament. However, it is perhaps the Sardinian view was more akin to Ancient Egypt where the ram was seen as figure of fertility. Was it used here to represent the properties of the waters here? One wonders the connection too with the Urthos from the Fonni carnival which are supposed to represents the ‘God of Darkness’, identified by some as a bear, but the hair is clearly a ram! Sadly we shall probably never know the significance of this sacred site. 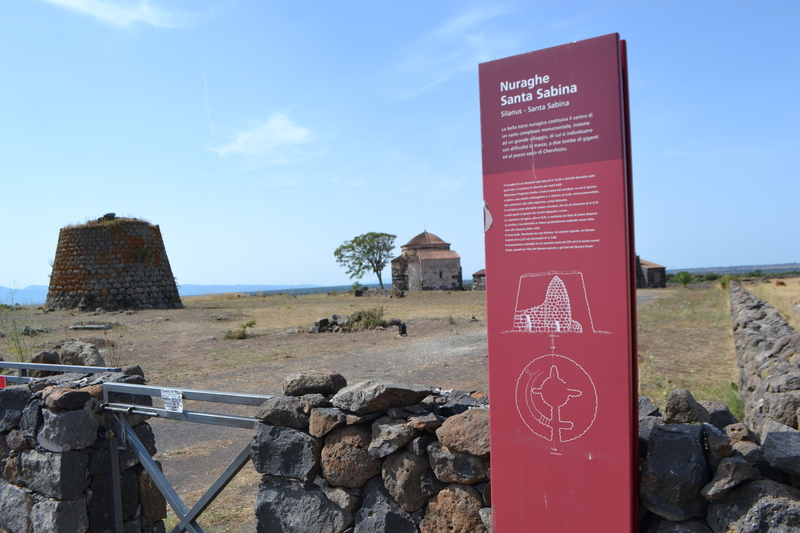 The road through to Macomer from Nuoro passes one of the island’s most iconic views, the Romanesque beauty of Santa Sabina beside a large intact Nuraghe from the 1600 BC laying on the desolate plain. Nearby were two giant’s tomb, but these was destroyed. The church is a wonderful relic and is unique in Sardinia. Dedicated to the cult of Santa Sarbana and was probably constructed in the mid 11th century. It is made of three distinct parts; the central circular covered by a dome and two side compartments covered with barrel vaults. 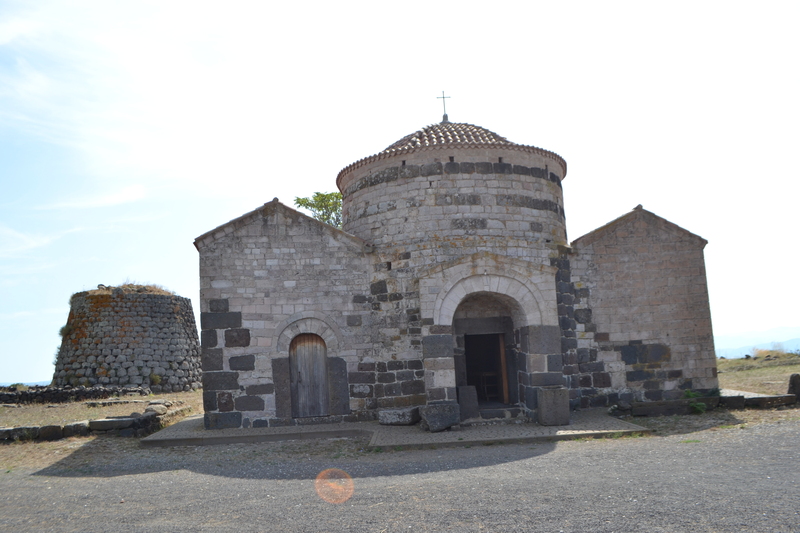 It is thought that the site was an early Christian baptistery. This is perhaps significant and may hide a lost significance for a site close by. Like the giant’s graves, similarly, my indispensable archaeology guide related to the sacred well in the complex but notes ‘no traces are found nowadays.’ I visited the complex and had left it there but reading the leaflet given out it noted the survival of Su Cherchizzu, returning to the site I managed to explain what I was looking at and was directed across the road and up a dirt track, 400 metres from the more noted church. The site was discovered in 1881 by Vivanet, but then largely forgotten being abandoned. It was not until 1982 that a survey by Foschi revealed more including some pottery fragments but it was not dated. The well is found in a small enclosed area and is completely buried beneath the ground. Twenty steps, 50-70 cm wide and five metres long take us beneath the ground and reveals it to be full of water. 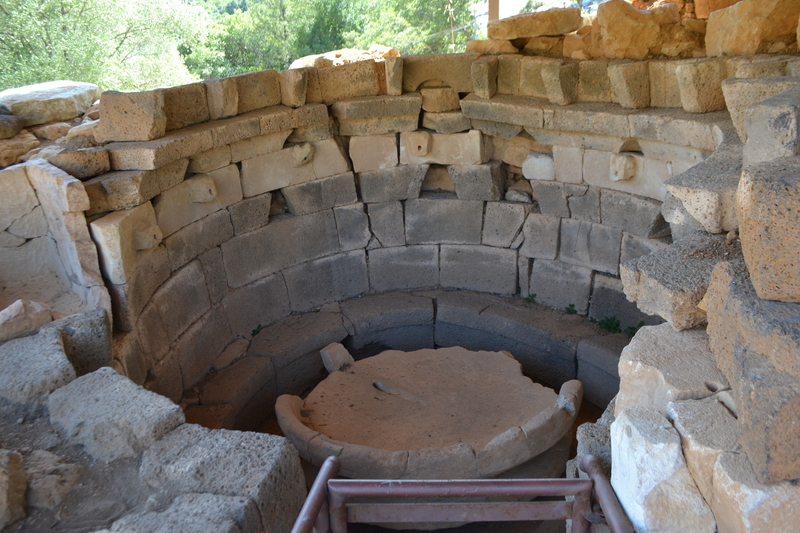 Looking up is a stepped ceiling and a circular well tholos of two metres. The structure is made of basalt to maintain the water in the well and it still had some considerable volume in the hot August sun. Entering the chamber you immediately became divorced from outside yet again and wonder what uses these waters had many centuries ago. The Roman occupation of the island has left a few remains although not as many as the mainland Italy. The most remarkable of these is the spa of Caddas, called Aquae Ypsitanae, a name coined by Roman writer Tolomeo. 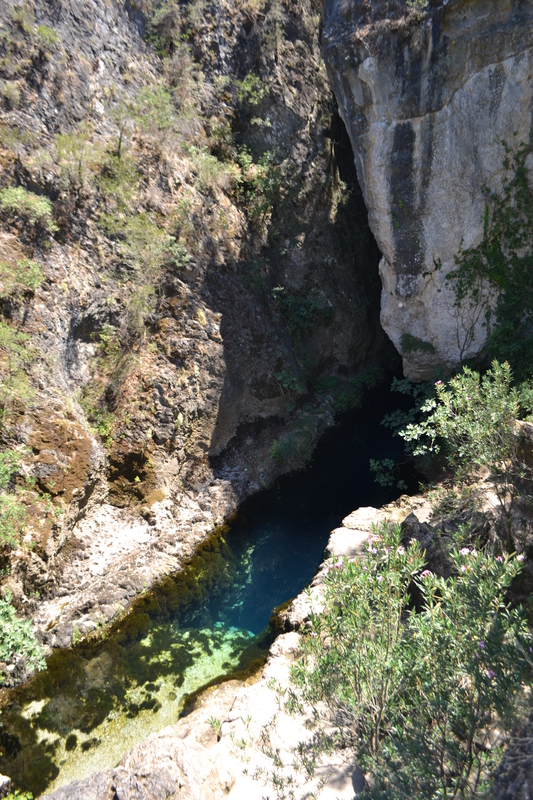 It is an incredible survival nestling on the banks of the river Tirso. Established in the reign of Trajan the site consists of a forum, an amphitheatre (a few metres off site) and the spa. Being located at the most significant thermal region on the island, and even on a hot August day steam can be seen building up over its waters. For those familiar with the site of Bath in England, the site is particularly interesting as it gives an idea of what that site would have looked like before its most recent improvement. The oldest section of the complex dates from the first century A.D. and it was occupied until third Century. The central focus on the ruins is the 12 by 6 by nearly two metre deep natatio, or bath. This is filled by the thermal spring which arises to the south of the site. These waters were mixed in another bath with cold waters entering from higher above. In such a way waters could be controlled. Other baths exist to the north and a cloaca or channel through which the water drains into the river. Over the natatio was probably a barrel roof, the arches of which remain. These arches enter the most interesting relic a nympheum, which was probably a small chapel. 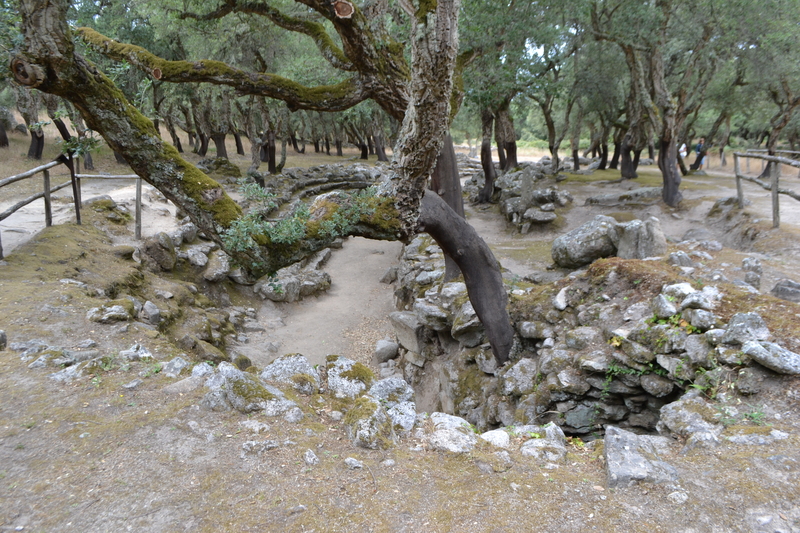 Here Esculapio, God of healing and nymphs were invocated for their guidance and power. 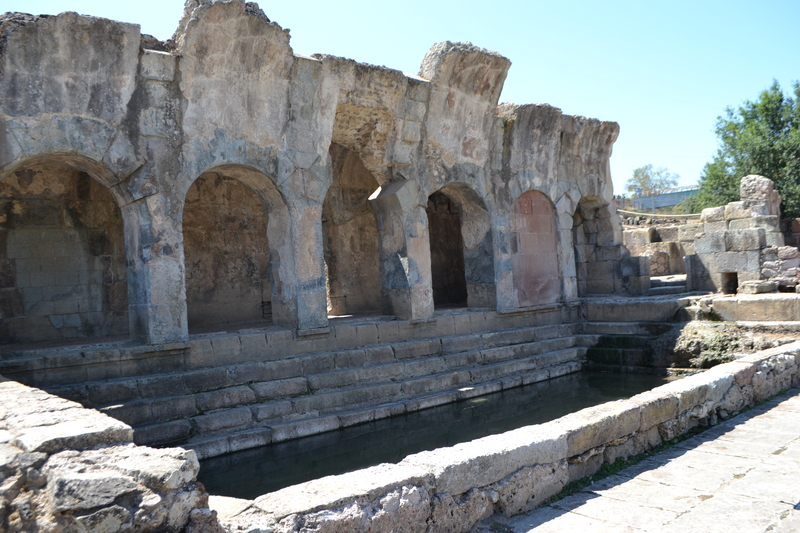 These parts formed the original nucleus of the spa complex of which, a frigidarium, tepidarium and celidarium complex was used utilising cold springs. It was thought that an aquaduct provided water from Mount Grighini but it is noted that as water on site is still so abundant it would have arisen here. 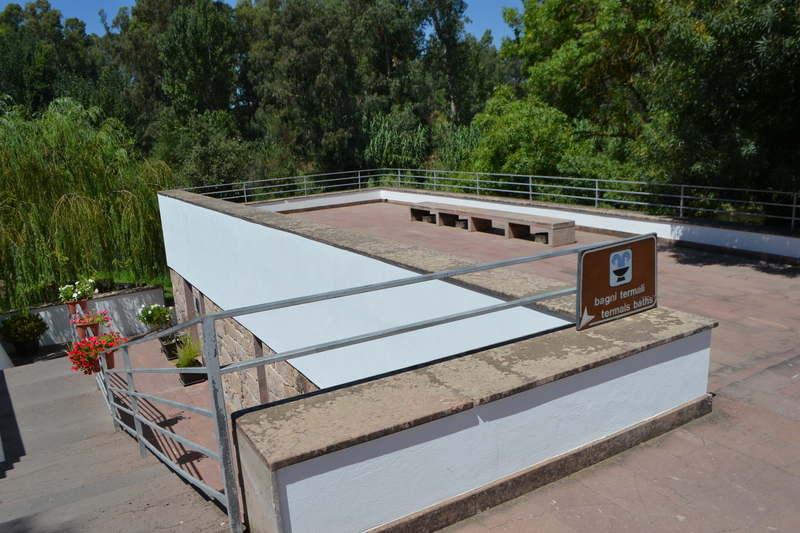 For above the Roman ruins are the large tanks holding the spring water. These have been carved into the rock and are despite their algae covered waters still flowing from here and through the complex. 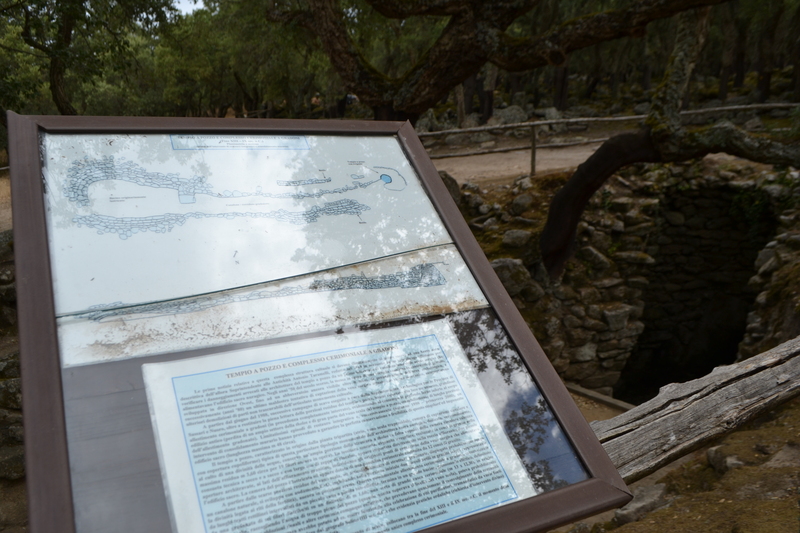 The hot spring arose separately in such a small distance from the cold springs a quite amazing fact for these early engineers to note. 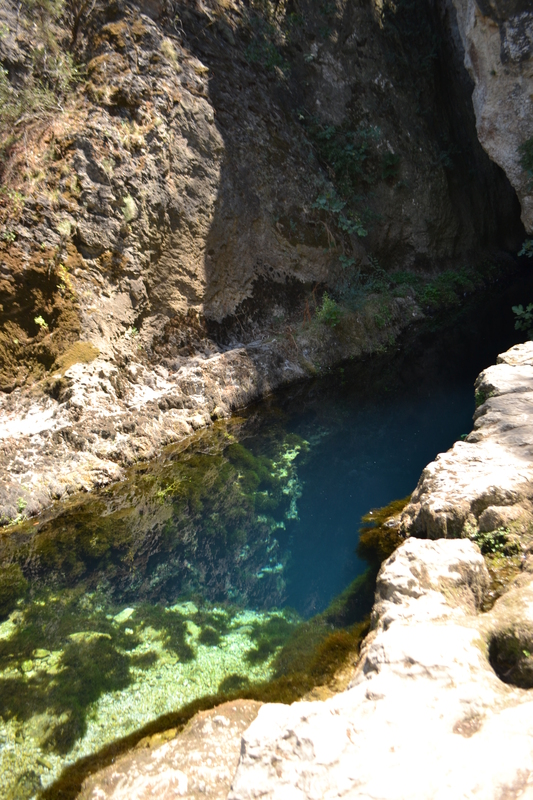 This hot spring is also a sulphur spring which has lead to healing properties. Whist it is not beyond realisation that one could still utilise the spa site today. The town of Fordongianus is still a functioning Spa town beyond the site. 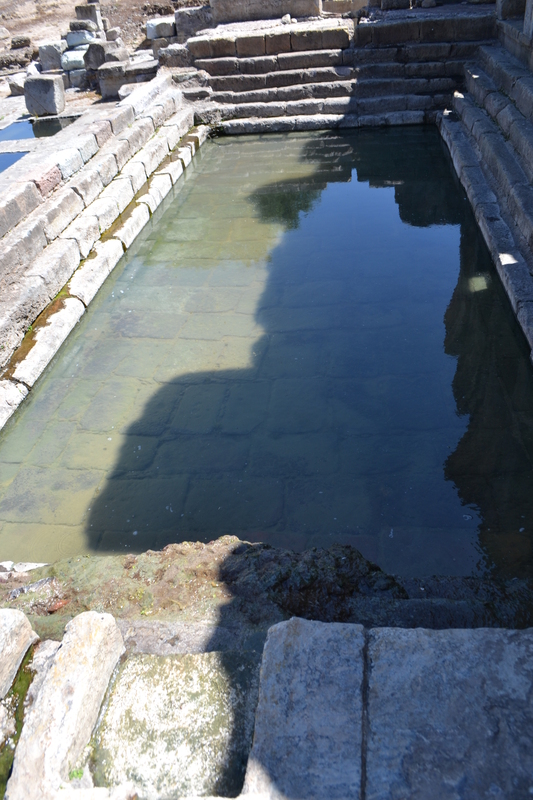 A few metres from the Roman site until recently visitors could experience the hot waters in a Bagnio Termali. This nestles closer to the village and below the level of the road. Despite its fairly modern appearance the site dates from 18th century. The site derivs its waters from another spring which fortunately are slightly colder being 44OC Sadly it appears that the site is now closed it but spa bathing still survives with an enormous investment being made into a more considerable spa complex. As the small linear building is only big enough for a normal sized bath, the new establishments located more centrally in the town. These farm more modern hotel facilities still provide the same, if slightly more modernised, wellness treatments provided by the Romans – little changes. So not only can we marvel here the cleverness of the use of both cold and hot springs which the Roman engineers manipulated excellently to provide a tepid and more tolerable water, we can see its use remains today. 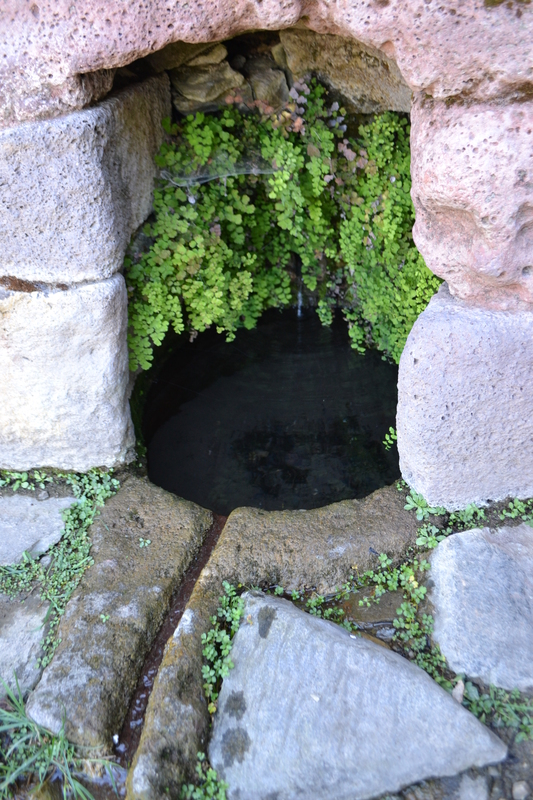 Many of Sardinia’s great sacred wells are found in romantic lost landscapes, dry arid fields or high in mountainous regions. However, one of the island’s most significant and evocative is found a few feet away from a busy main road, tucked behind an industrial estate and often overshadowed by the multiply planes which fly in and out of Olbia airport from across Europe. This well enclosed in a quiet oasis is that of Sa Testa, well sign posted from Olbia. The site’s discovery was in the 1930s by shepherds seeking out water supplies. It was subsequently excavated by Franceso Soldati in 1938 and subsequently restored in 1969 by Ercole Contu. The work revealed bronze objects, such as dagger hilt, bracelet, ring as well as fragments of cup. These pieces placed the date of the site in line with the other sacred springs of the island, around Bronze Age end, 1200-900 BC. However what is perhaps more amazing is that this was a site of continued ritual use. 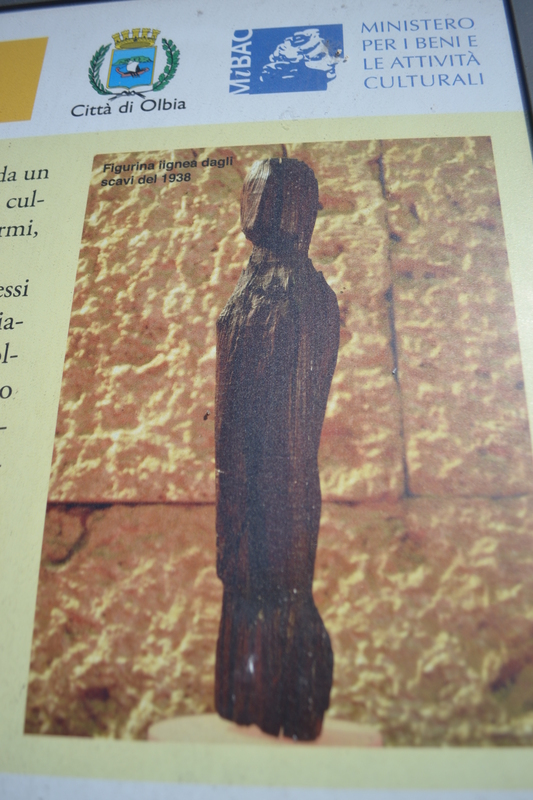 A fashioned juniper wood figurine was the most interesting. This was believed to present the archaic Greek God of Xoanon, a sort of phallic like large headed and little or in this case no armed deity, which dates from the 7th to the 6th centuries BC. Also found were thymiateria, Greek incense burners. Both finds clearly indicate that the site was of ritual use by a group unconnected ethnologically to the Nuragic people who built it. These was probably deposited by Phoenicians whose black painted bowls and pitchers were also found. However, the finding of jar and cup fragments from the Tuscan pottery production of Arezzo, emphasizing the influence of the Romans and their continued use if not for cult reasons than for domestic use. The ritual use by the constructors is suggested by the curious circular courtyard arrangement, 8 by 7 metres approximately around the well. 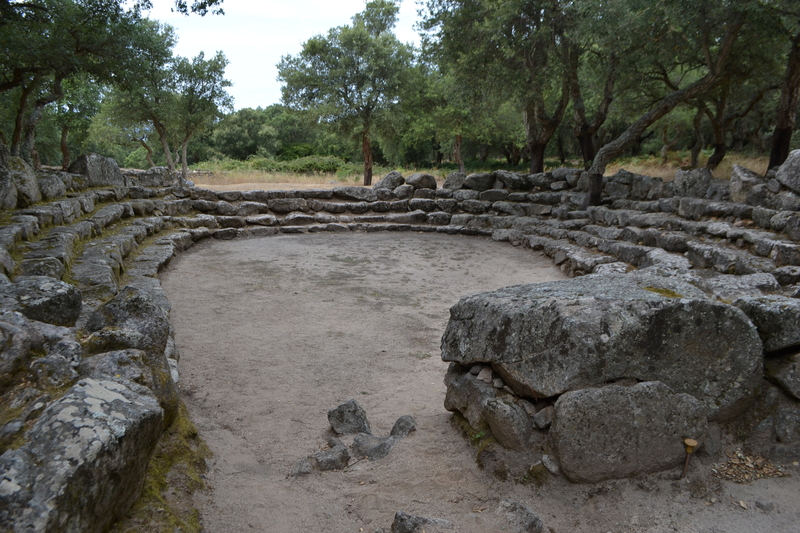 This appears have been constructed so that some ceremonial activity could be undertaken with the circle with the ‘priests’ or secular members watching from around the edge from a bench. One view is that this site like that of Santa Christina was aligned astronomically with the moon’s minimum and maximum declination during its 18.6 year cycle. Although not the largest of the wells, it is nevertheless substantially made. 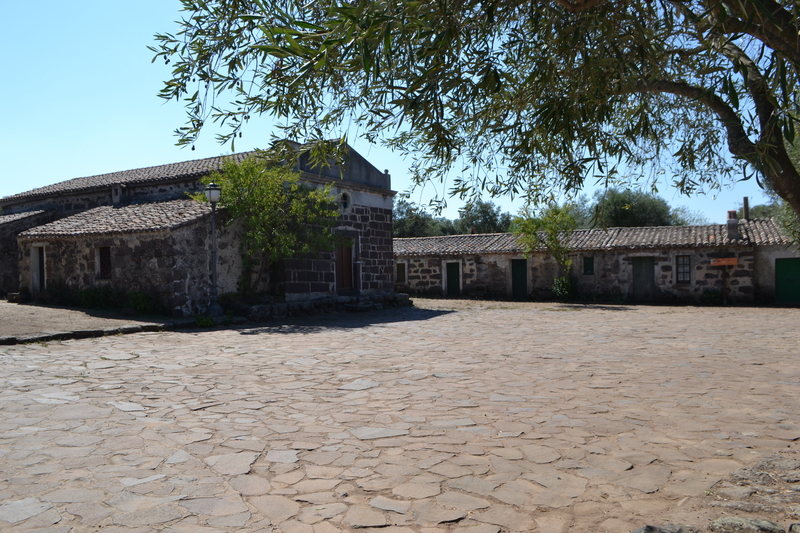 Built with cut granite and shale blocks it covers a length of around 18 metres and consists of a circular courtyard,, trapezoidal entrance, staircase and a tholos roof to the spring head. 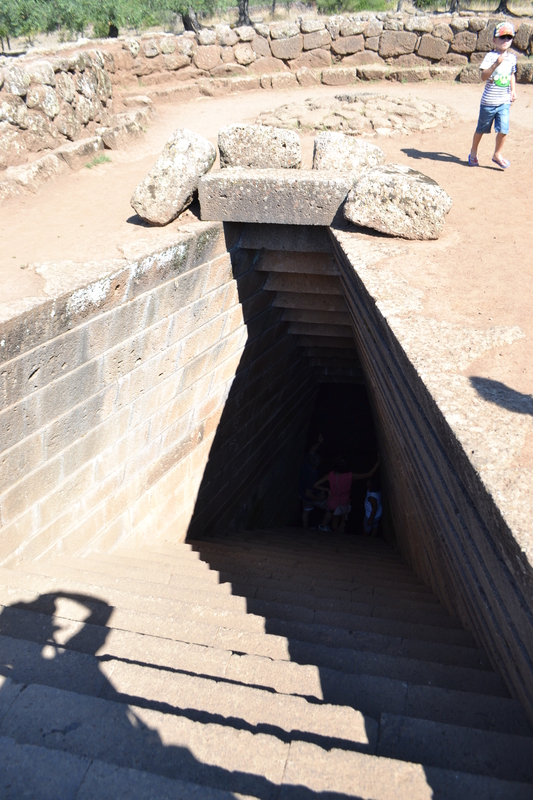 A second tholos has been lost but steps still ascend to it. Seventeen steps make their way to the clear deep water and to descend into them divorces you immediately from the hot air outside. The channel down through which these steps descend is made of shale and is narrow. What is also interesting in a paved over channel which goes from above the source and round into the source. Such an arrangement is usually stated to be collect run off but with a strong source even today in August why collect rain or condensation water? Was there another source above or was something else poured into the channel to collect in the well? Perhaps we shall never know what happened in this enclosure but despite the industrial and urbanisation around one can just feel the separation from modern times in the cool confines of its chamber. 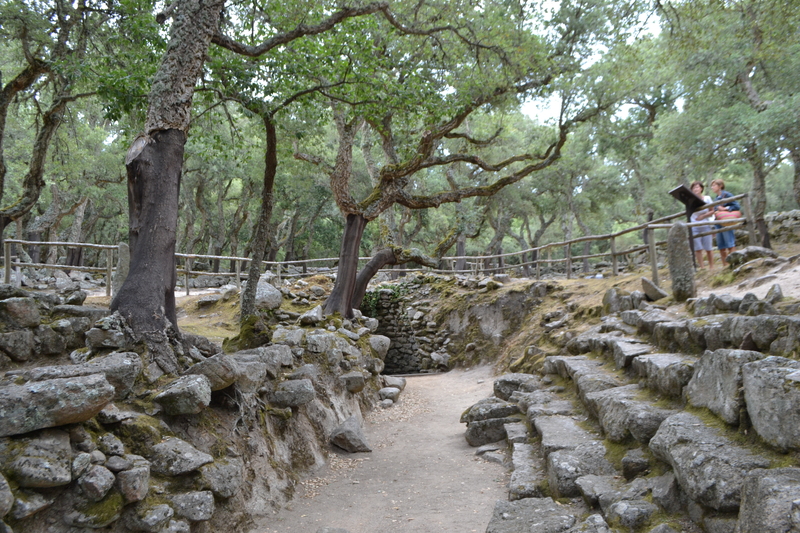 Delightfully situated high, at 750 metres above sea level, on a plateaux amongst the gnarled cork oaks is the Nuragic settlement of Romanzesu di Bitti. 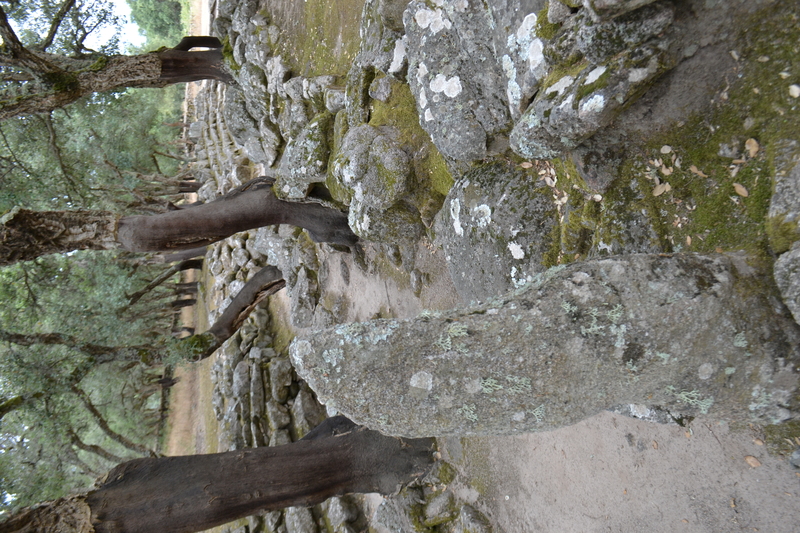 The site is believed to be one of the most important sites of worship of the Nuragic period. A site by its name suggests a long continuation of its usage into the Roman occupation of the island. Like a number of similar sites, the site was revealed by accident during the search for water in 1919, when Antonio Taramelli a local archaeologist. Sadly, during the excavations, a number of parts were destroyed; the scale trapezoidal coming down the well was destroyed. The water was also diverted into a trough and even in the 1950 new reclamation work utilised the well for a modern sewer and thus a number ceramic pipes were placed at the site in blocks of local granite. As a result interpretation has been difficult. The village dating from the Bronze Age extended over seven acres near the source of the Tirso river and consisted of a hundred huts, a rectangular temple, two megaron temples and a strange labyrinthine structure as well as the sacred well with its amphitheatre basin with its elliptical terraces. 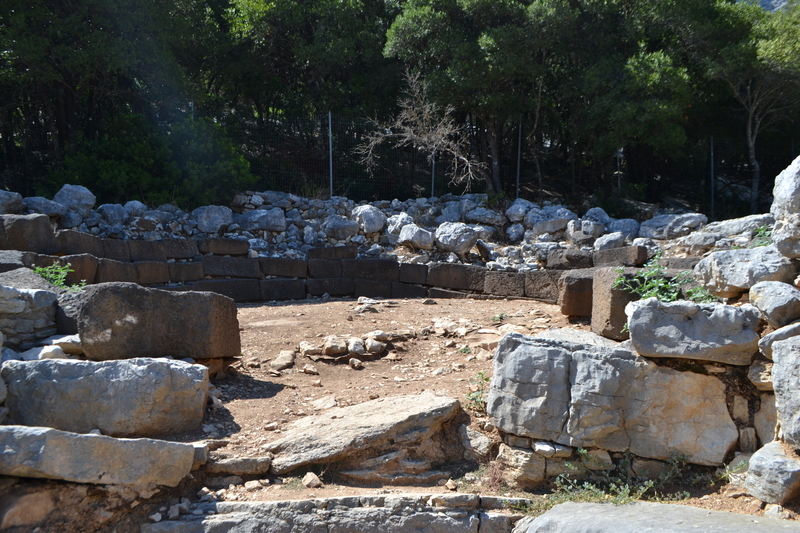 The megaron temples are similar to other sites with circular pits which may have collected water for ablutions or supported a roof, no one is clear. Similarly what significance there is the labyrinth is unclear. The remains show a hut structure with concentric walls to a central room with a circular stone base and some paving. The archaeologists found red quartz pebbles at the site. It was perhaps the house of a sorcerer who may have been the person in charge of the ritual centre. However as no site similar has been found this is pure speculation and indeed what role this building had to the sacred well and amphitheatre basin is unclear. 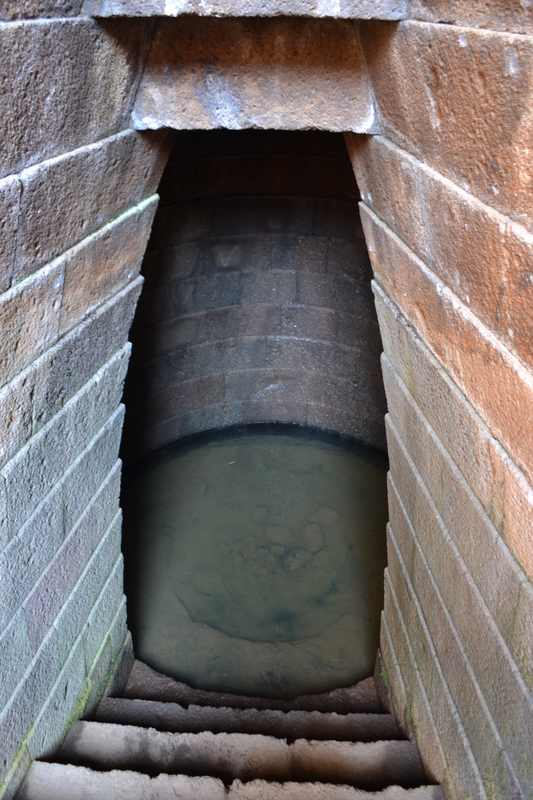 The inner circumference is deliminated by a large bench consisting of four slabs on the left side and eight on the right which may have contained the water or allowed access. The structure is more obviously built upon the natural rock than other sites has a small rectangular opening around 30cm where the spring flows from. 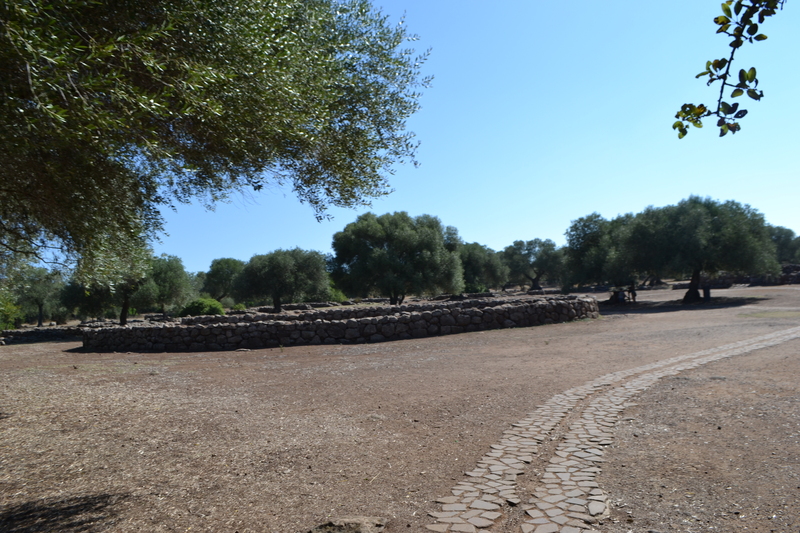 Originally it was a tholos structure which has a domed roof. The site is believed to date from the Bronze Age to the IXth century BC. 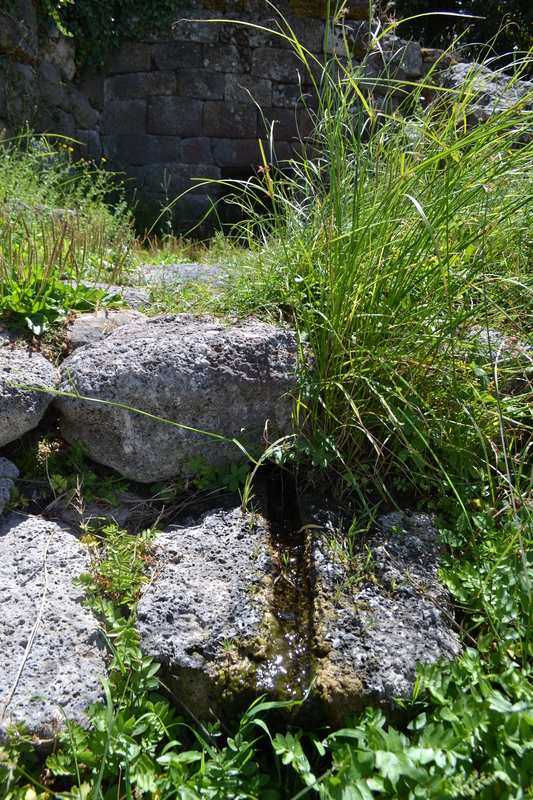 Around the well are two sacred objects, small surfaced betili (stones representing the deity linked to fertility rites) still upright but what role they had with the water is unclear they may have represented deities of the water. From the well is an unusual 42 metre gully lined with steps which carries water from the well to the unique amphitheatre. This most remarkable relic is the most puzzling – a large sub-circular basin originally paved with six rows of terraced steps. What was it for? Often it is now dry but on occasions water has filled it to provide an idea. One theory is that it was done for communal ablutions or perhaps baptisms. Perhaps even for purification rites? The 3rd century AD Latin geographer Solino highlighted ordeals with water especially to judge crimes perhaps like those done for witches to see if the water would find them innocent. 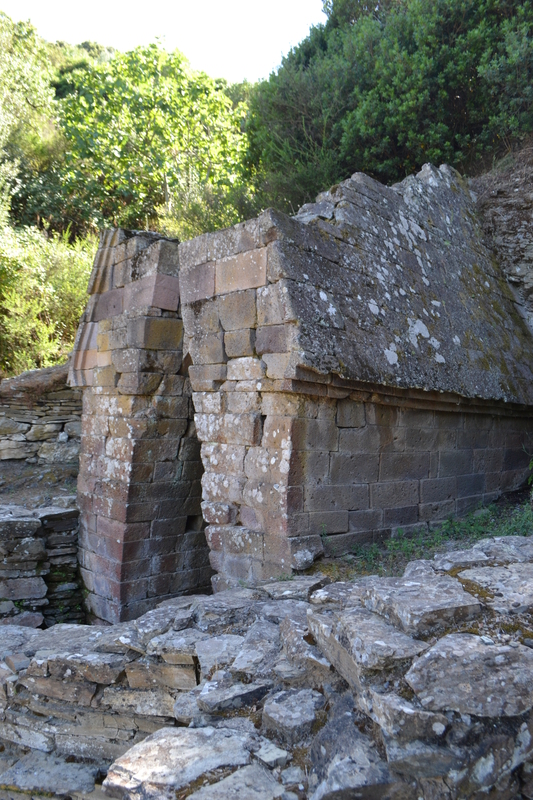 Imagine you are digging your allotment and soon something is revealed – one, two….more and more worked basalt blocks…soon one of the most remarkable pozzo sacros to be discovered in Sardinia was discovered. 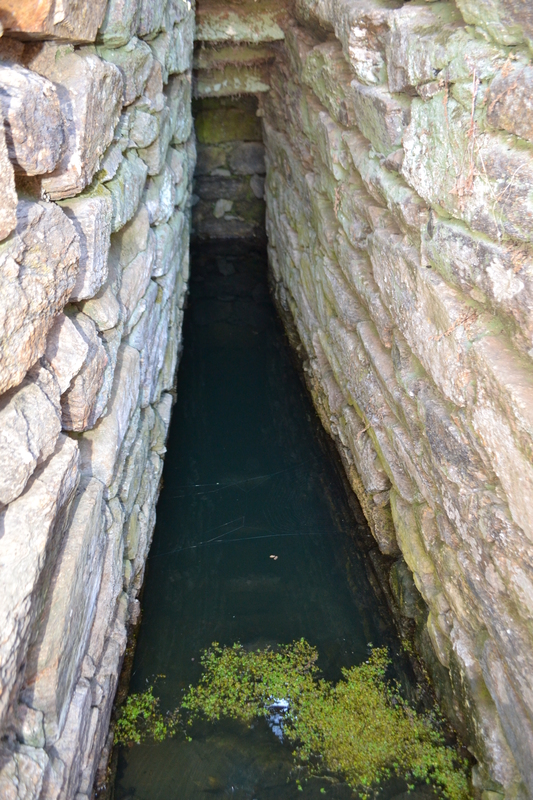 The only one which gives archaeologists an idea of what originally covered the other sacred wells of the Island. Orune’s Pozzo Sacro Su Tempiesu is not remarkable not only for its good preservation but also for its exceedingly remote location. In the summer of 1953, a member of the Sanna family was said to be either planning a vegetable patch or digging for coal, found some worked blocks. What soon revealed itself was something quite unique an intact, bar the very top of the arch, sacred well. The site was excavated in 1958 and then in 1981-86 resulting in consolidation to the appearance it is now. 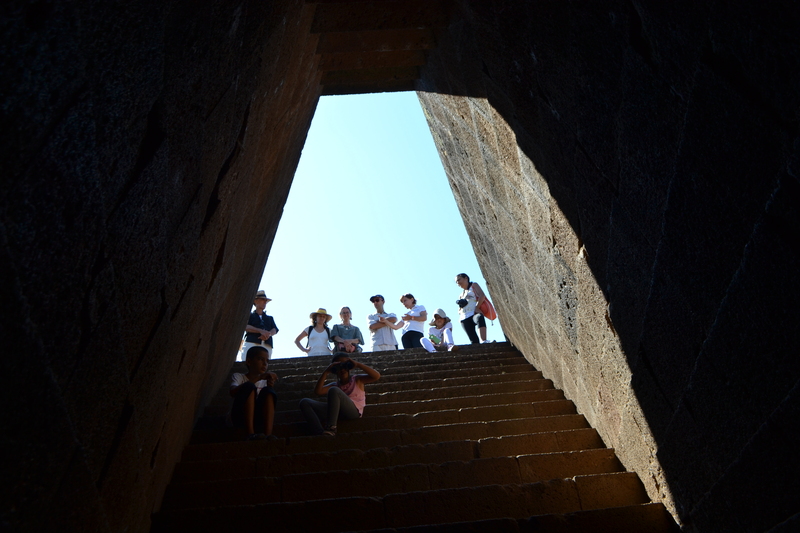 The temple consists of the usual arrangement – vestibule, staircase and well chamber. 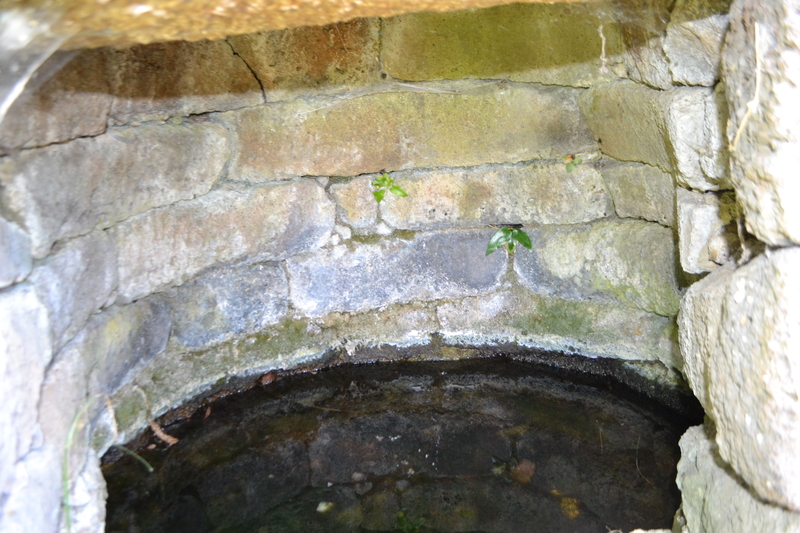 The well chamber appears to have been set up between rock shale walls to cleverly channel a spring which erupts at the junction of a vein of rock. The vestibule, quadrangular in plan, with a depth of 1.60, 1.85 width, and height of 4.50 m. The floor has a slight slope with projecting walls constructed of large perfectly jointed slabs, with perfect joints. There are decorative arches set into the upper wall. The cover of the well has a dual-pitched roof with double eaves, with an acute triangle gable roof with a truncated pyramid ashlar, which had twenty votive bronze swords inserted into it. Two seat benches and two small rectangular cabinets are set into the side walls of the hall. 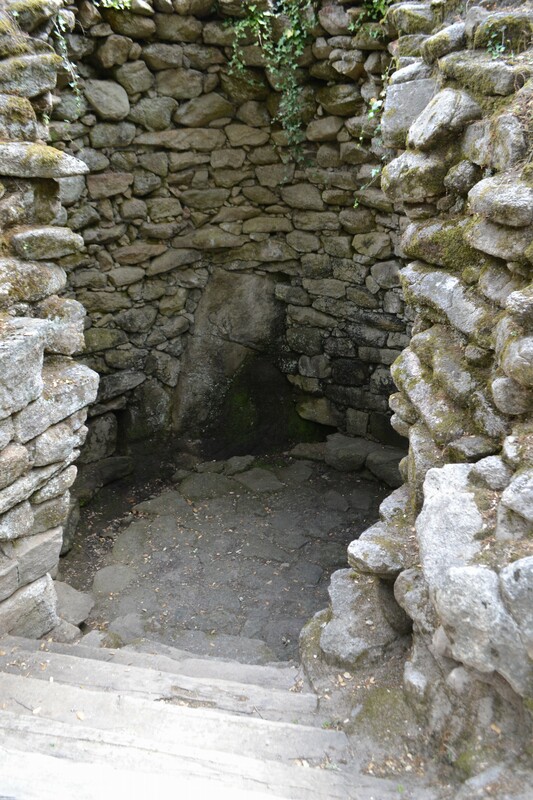 A staircase reaches to a small room ‘tholos’ which covered the spring which has a flagstone floor with a central dimple. The engineering involved to ensure that the spring is clear and lacking in impurities is one of the most impressive features of the well. The water enters its tholos chamber, as like Santa Christina. This one is smaller having a base of just below a metre and 11 rows of perfect layers which form the nearly 2m done. 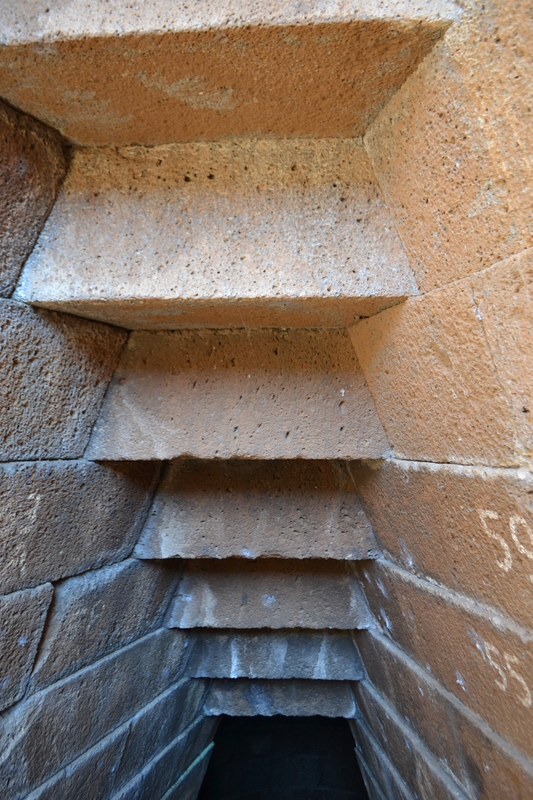 The cavity’s base in basalt paved and slopes towards its entrance which has a number of steps leading to a threshold step. 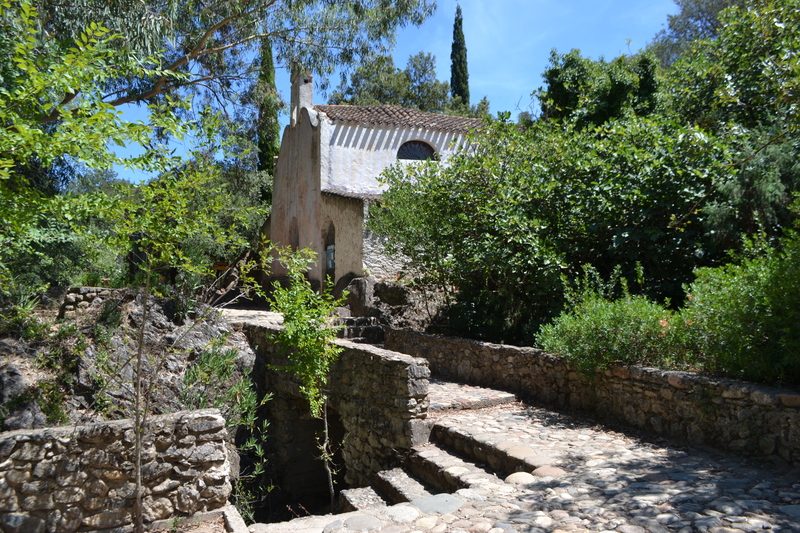 The well has a porch or vestibule which is paved by slabs of gently sloping trachytes. This is bounded by a wall and these become a very narrow pointed arch. However this arch was destroyed by landslip. However the base which holds the water is circular in shape and has a dimple which allows decantation and collects impurities. Furthermore, the water then flows through a moulded groove, running obliquely left to right into a smaller basin. 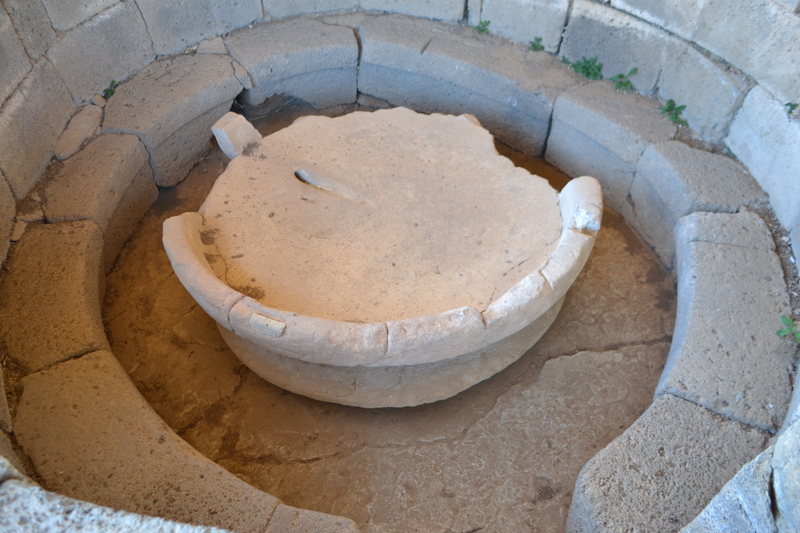 The purpose of the smaller basin is unclear if it were built for domestic uses one would expect livestock use but as the site is ritual unlikely. Did it provide a location for ritual washing of objects to be placed in the niches and shale shelves which remain within the structure? Indeed, this site did yield a number of very interesting votive figures. This well chamber’s arrangement in itself is of course impressive but the structure above the well is awe inspiring considering its neatness and that date between the 10th and 12th Centuries BC. The structure is made of trachytes igneous rock, very hard and very difficult to fashion – yet it is squared and cut perfectly without any crooked sections. There is no mortar but lead cramps and everything is iodomic – of equal size. What is equally remarkable is that as the natural rock here is shale it must have been moved probably from the district of Dorgali – this suggests perhaps that the culture recognised the importance of this rock either because of its durability and its ability to hold water. To reach the well today consists of a long and undulating car journey from the town and an equally long pleasant downward walk (but a very tiring one going up! )…a location so remote one wonders why it was here. However, evidence does show that a short distance away was a nuraghic settlement of S. Lulla which may have used the site. Inside the structure were a range of votive offerings. These consisted of bracelets, pins although these were weapon based, rings, swords and buttons which suggest a long period of devotion, from Bronze to Iron Age, although what is not clear is what each offering bestowed and meant. The most noted were three figured bronzes or bronzetti figures one showing a beared male figure, another holding bread and a pair of figures together said to be bidder. 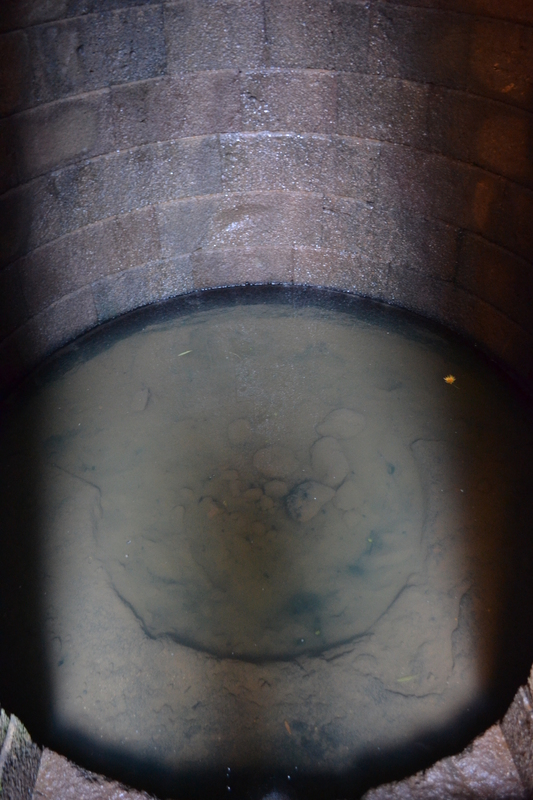 The flat top of the well, had 20 swords stuck in the top…the reason unclear. The Su Tempiesu is an amazing discovery which was fantastically restored and gives a vital view into the Bronze age water worship of the island….the other posts this month are all about restoring sites..
Su Gologone is a considerably important site on the island. The site’s arrangement is reminiscent of a spa, with an entrance fee, gardens and a nearby hotel. Also for those familiar with the UK, in a way one is reminded of Mother Shipton’s cave and petrifying well in the set up – but cheaper. Paying one’s entrance fee and following the track around one reaches of the most incredible springheads on the island is that which arises in Oliena muncipal area. A platform is raised over it and one can see down to the rocks below. Like many sites on the island, it is well signposted as well, courtesy of a nearby hotel. The sheer captivating beauty of this spring is hard to ignore, yet it does appear to have made any major cultural or rather religious impact. Which in an island such as Sardinia quite bizarre. The spring arises from a deep rift in the rock being a Karst spring, being the most important in Italy providing around 300 litres a second of clear, ice-cold and beautiful mineral waters erupting from a great chasm in the rock, the water turning into a stream which joins the Cedrino River below. 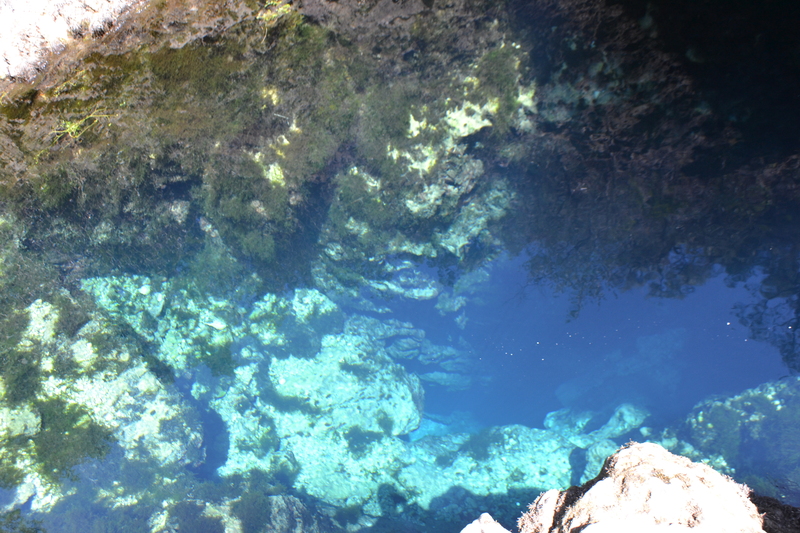 A Karst spring is one which arises from the permeable limestone, dolomite or gypsum and often erupts from a cave system. This spring is one of the most dramatic and beautiful. The water of the spring is certainly valued and when I was there a large number of individuals travelled some distance it appears to take the water. Has the spring been ever culted? As far as I am aware no prehistoric cult artefacts have been found at the spring head however only a few yards is a small church dedicated to Nostra Signora della Pietà, a lady well perhaps? The presence of a church may be significant, particularly one which is so inconvenient in its construction set upon a rocky crag and with a very uneven floor…my bottle of water rolled some considerable difference. 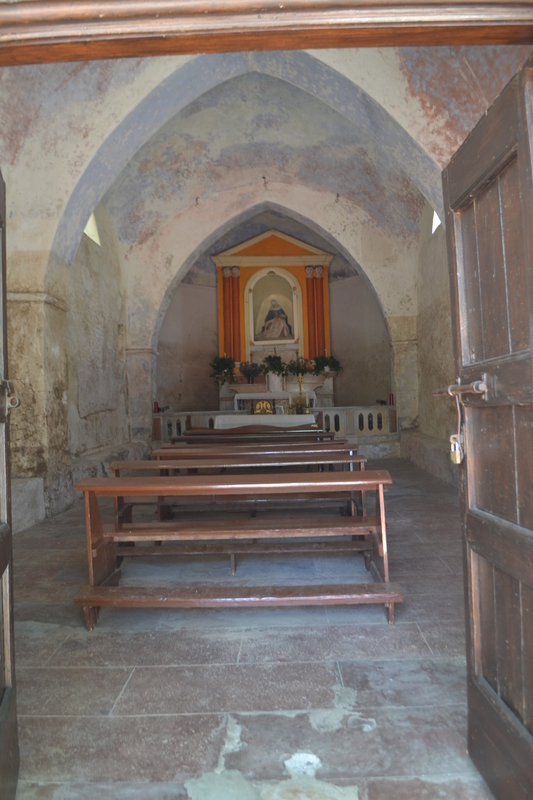 The church is very simple, consisting of one chamber focused on the altar of course. How much significance we can read into this little chapel so close to a great spring is unclear but as there is no evidence of a settlement in the proximity perhaps a bit. I hope this brief piece will find someone who knows!? There is so little known of its significance. 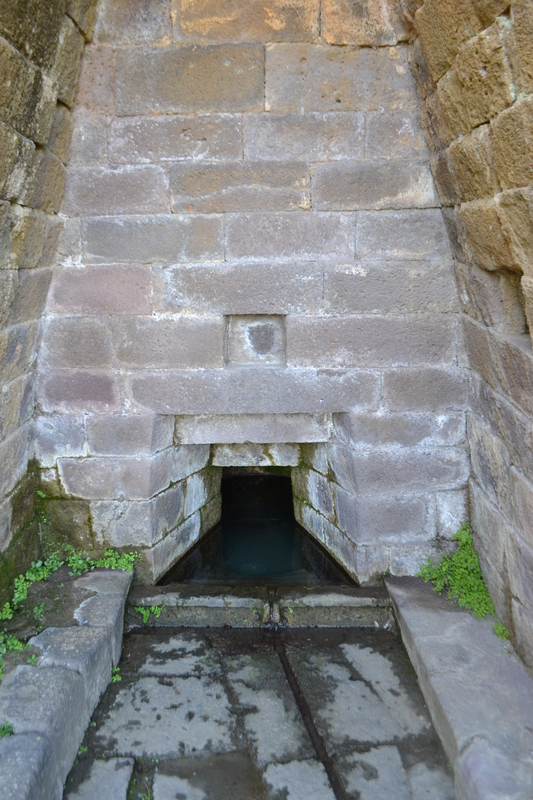 “the well of Santa Cristina is regal; it represents the apex of architecture for well temples. The balance of its proportions, the precision and refinement of the interiors make it hard to believe it dates back to around 1000 B.C. and that it is an expression of nuragic art, before the presence of prestigious ancient populations on the island”. 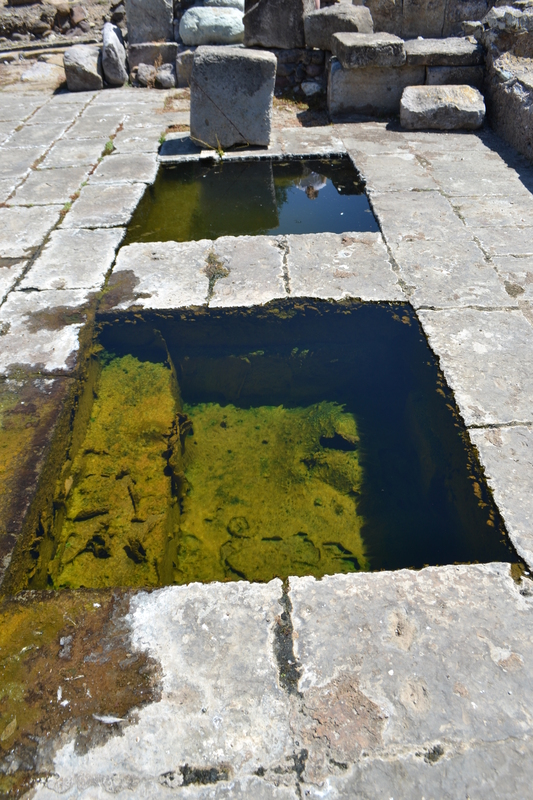 As I indicted last month, Sardinia is one of the best places to experience the ancient water worship. Certainly, the most remarkable of all these structure is that found at the settlement of Santa Christina at Paulilatino. This has been a site on my to do list for many years and it wonder does not disappoint. “built with rough stone, not like a small well nearby, funnel shaped and built with finely finished volcanic stones, which had been put together with care…”. The enclosure around the well. 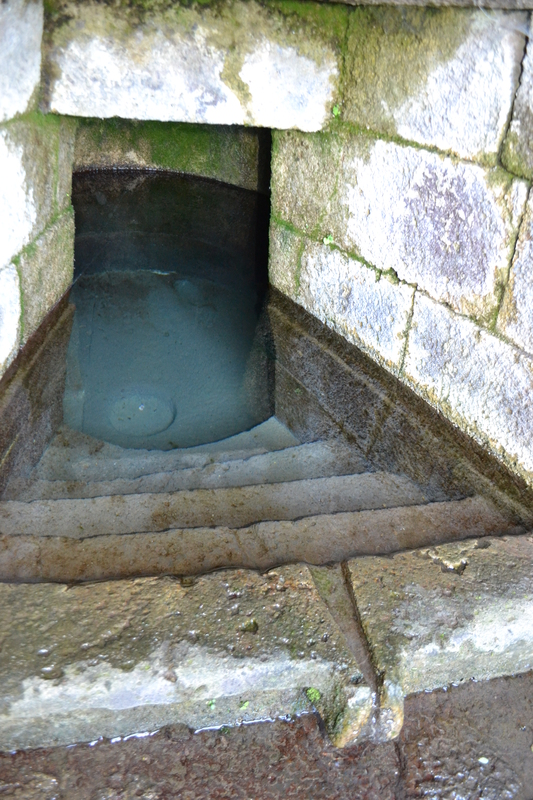 The steps down the well. Looking from the tholos roof opening to the steps and end of enclosure. “The work is cyclopean; it has been built with big volcanic black stones, from a local cave, and without cement in the same manner as nuragic constructions. The access is through an underground passage, with a perpendicular vaulted roof made with overlapping stones that create overlaying layers. From top to bottom it is over 4 meters high. 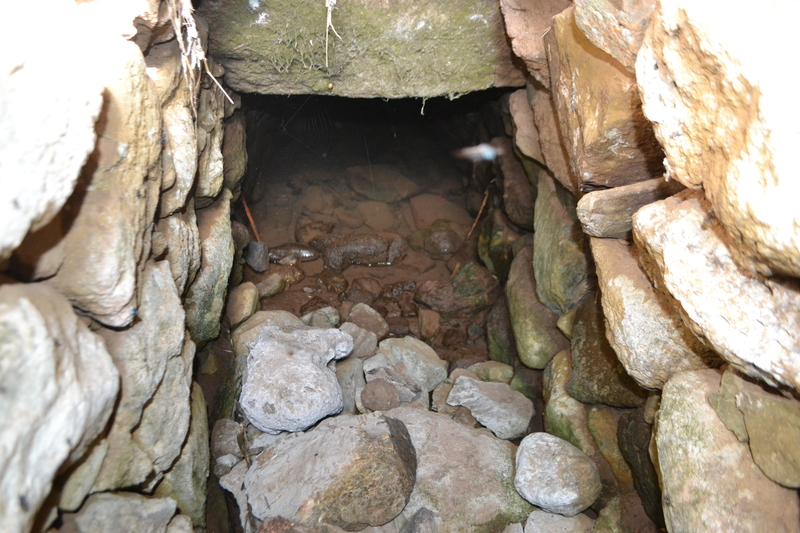 A first layer of massive stones rests on the rounded wide base, on that first layer there is a second smaller layer and so on to the top with a total of 10 layers narrowing towards the top to form a shape of a cone cut short and the mouth of an ordinary well; a man at the bottom would not be able to climb out because the shape of the stones form an upside down staircase”. Looking from the well chamber up the stairs. A prison for a saint? “These consisted in a well, or a hole in the ground, with a vaulted ceiling and a mere opening at the top to let the light through…this suggestion is also confirmed by the belief that it had been the prison where the tyrant had placed the Saint, and where the former had been tortured… It could not have been a well, firstly because there was a fountain near by, which is never missing from the edges of areas with Nuraghes; and second, the absence of cement would make it impossible for the structure to stand the water volume. Also the presence of the underground staircase makes it unlikely that it functioned as a well”. 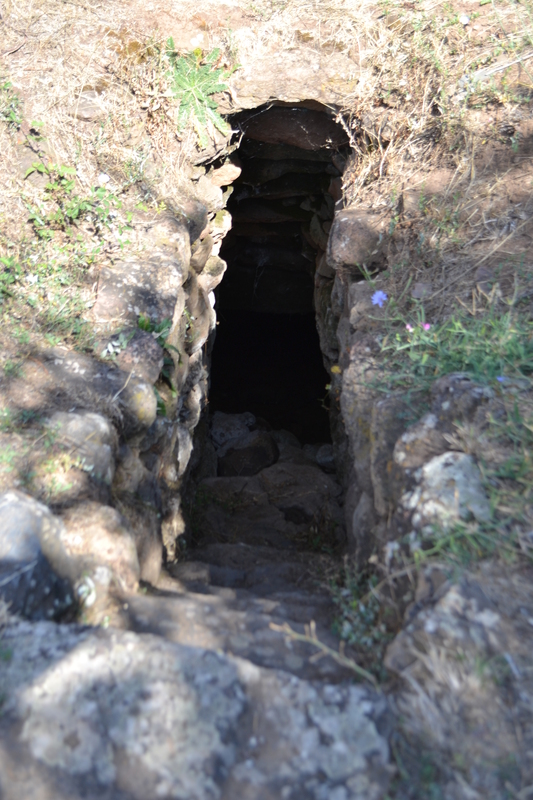 Steps down to the well chamber. 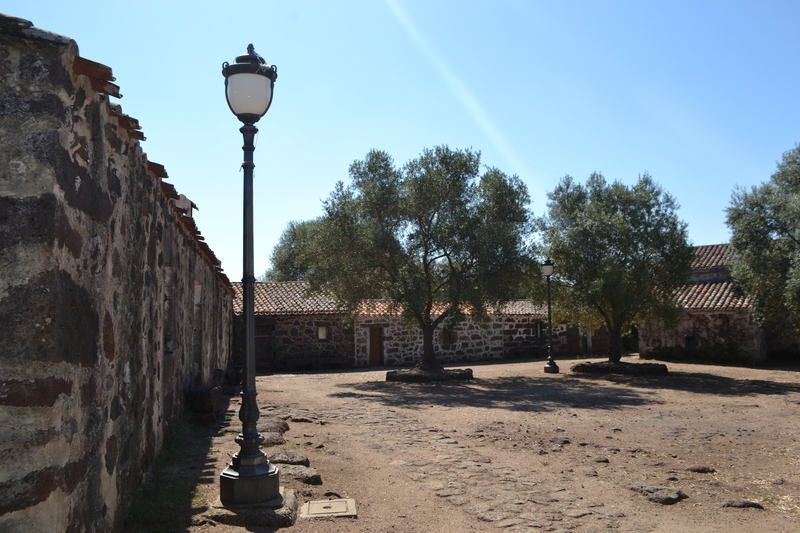 This recognition of its use as a prison is related to the life of the saint associated with the site. 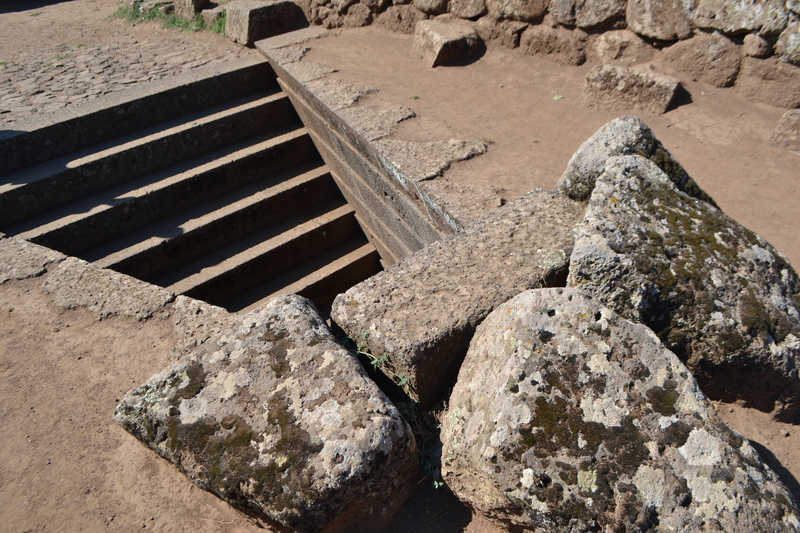 A martyr of Bolsena, under Diocletian in the IVth century, the eleven year old virgin Santa Cristina also said to have been imprisoned in the central tower of the Nuraghe (or the well temple) being killed during a war between Paulilatino and Bonarcado. 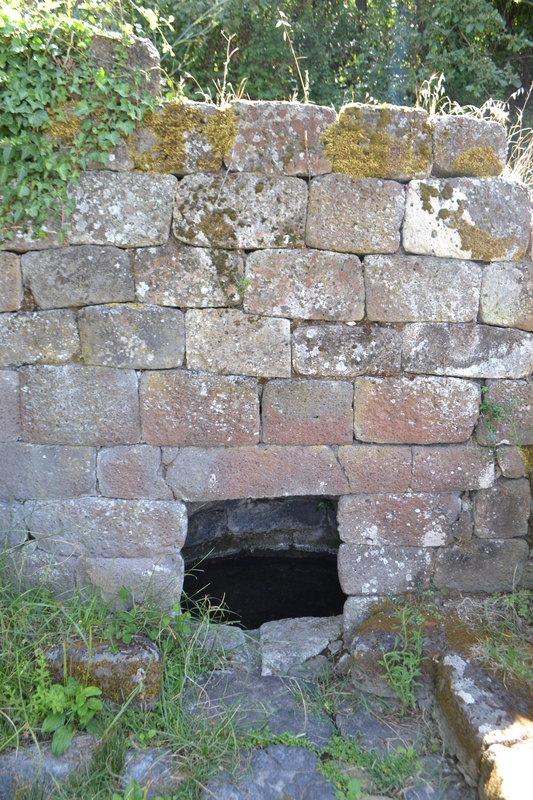 Another legend tells that her father built the well because she had become a Christian and as she descended the well, her clothes were said to have touched the wall and created the offset in the structure. She is a significant saint to be associated with the site as one legend states that she was sentenced to death by drowning when a heavy millstone was tied around her neck when she was thrown into a lake. However, she was saved being floated back to shore helped by angels. Close up of the full well basin. Or was it a tomb? Finally the great early 20th century archaeologist Antonio Caramelli, after the discovery in 1909 of another site at Santa Vittoria of Serri together with the finding of sacred objects there, small bronzes, that it was related to well worship. 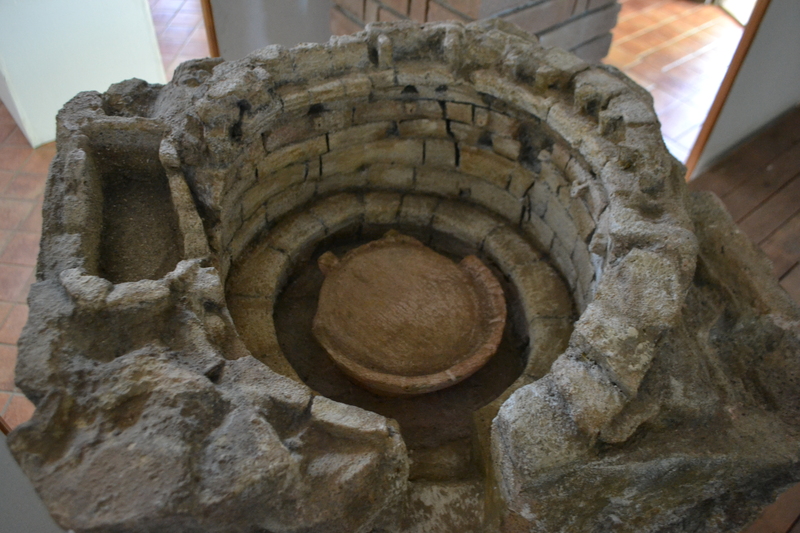 Giovanni Petazzoni in his “Religione Primitiva della Sardegna of 1912 argued that the wells were of ancient origin related to the island’s first settlers despite claims that such edifices were either Carthagian or even Medieval in origin. However, Phoenician little statues found on the steps of the temple, anthropomorphic clay figures, figurative terracotta objects, pieces of necklace and other pieces suggest a date of XI century B.C. The roof resembling the stair case. “The structure was used as an observatory of the maximum lunar declination towards the end of December and the beginning of January; at this point the moon’s reflection was in the water. During the vernal and autumnal equinoxes the sun light reflected all over the staircase and it reached the water”. The only snag in this theory which has been developed into a fully fledged book is that the hole through which the light penetrates was not perhaps as open as it is now as surrounding the well was another building although this may have had an opening of course – but we cannot say but it can be read about here in depth. Blurring light enters the tholos. However, when this procession started is unclear if the knowledge of the existence or rather function of the well was not known in the 1800s. Was it that no-one had thought to speak to these communities? Furthermore it would be impossible to think that the festival would not have arisen from whatever customs were enacted here many centuries before. Whatever the origins of these great relic it is one of the greatest of the island’s sites..and does not disappoint for anyone enchanted by the technological advances of these ancient cultures.